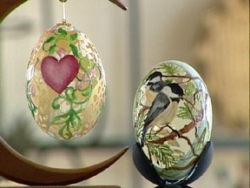 Get in on the new and growing business of egg engraving. A perfect introduction to this art form. Invaluable instruction in the fine art of egg engraving. You start with the basics and learn on goose eggs. Learn many tricks of the trade. Use these skills on Rhea, Emu and Ostrich eggs.